The first is to seek the aid of the Brotherhood of Steel in constructing the Signal Interceptor during The Molecular Level. Elder Maxson will give you From Within before you jump to the Institute. 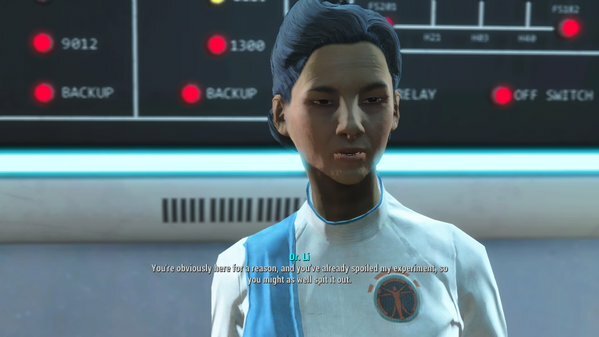 The second is to speak to Elder Maxson after you’ve completed Institutionalized and left the Institute. He will then give you this quest. Note that in both cases you need to have become a Knight of the Brotherhood of Steel at a minimum. - Seek out Madison Li, the head of Institute Advanced Systems. She has her own apartment, but the chances are good she’ll be in Advanced Systems, which is in the northwest of the Institute’s central hub area. Speak to her about the Brotherhood’s desire to get her back and she’ll demand evidence that the Institute has been playing foul. She’ll send you off to investigate the former laboratory of Virgil, the dude who helped get you to the Institute in the first place. - Head to Institute Bioscience, which is to the left when you leave Advanced Systems. Take the first door on your right when you enter Bioscience and wander through the unused collection of rear hallways. The entrance to Virgil’s FEV Lab is back here, behind a Novice locked door. If you find an open room with plants inside, you’ve gone one doorway too far. - There’s a Laser Trapwire right by the door that will trigger a Tesla Arc. Get rid of it before stepping any further inside. At the end of the hallway are two doors; the one that’s Novice locked leads to a small, adjoining office / control booth. There are a few odds and ends inside, and the two buttons will open and close the doors in the decontamination room beyond the booth. - Be careful opening the next door, as there’s a Turret on your right as soon as you walk through. Two more Turrets wait in the next room over. Under these Turrets is a terminal that will turn the Turrets off and on, assuming you managed to sneak by, and open the next door. - The next storage room is patrolled by an Assaultron, a deadly combat robot. Assaultrons are physically strong, and will fire massive beams out of their faces. Unlike many enemies, it is by far most effective to target an Assaultron’s body rather than its body parts. This room contains lots of good crafting stuff, and there’s a duffel bag with some ammo near the exit. - The next hallway branches off to the left and right in several places, though only the first locked door on your right contains much of worth. At the first intersection of hallways you’ll hit four Turrets - one to the left, one to the right, two straight ahead - that will pummel you with bullets. Stealth is advised for taking out at least one of them. There’s a Laser Tripwire just before the room with the latter two Turrets that can set off a Tesla Arc, as well, so be careful on your approach. - A Novice terminal locks a door on your right. (It also controls the Turrets, if you can somehow get this far without being detected. Unlikely.) Beyond you’ll find a somewhat nasty lab. Look to the right of the central tubes to find a terminal, and beside it the Brian Virgil Personal Log 0176. This Holotape is what you need to convince Li. - Before you leave, check the desk to the rear-left of the tubes from the entrance. There’s a machine back here that contains the Experimental Serum Virgil asked you to get. You don’t have to get it, but retrieving the Serum and delivering it to Virgil will earn his gratitude. - You can return to Institute Bioscience via the door on your left. Return to Li with your findings, then, once you can leave the Institute, report back to Elder Maxson.